The Dravida Munnetra Kazhagam on Sunday appealed to Tamil Nadu Governor Ch Vidyasagar Rao to ‘nullify’ the vote of confidence won by Sasikala loyalist E K Palaniswami, alleging it was adopted by contravening the rules of the state assembly. DMK, whose MLAs were en masse evicted from the state assembly before the voting on the confidence motion on Saturday, also announced a state-wide hunger strike on February 22, protesting what it called was ‘murder of democracy’. In a representation submitted to Rao, Stalin, also the Leader of the Opposition in the assembly, urged him to ‘nullify the entire proceedings’ to ‘protect the spirit of democracy and the Constitution’. DMK Rajya Sabha members R S Bharathi, T K S Elangovan, and Tiruchi N Siva submitted the representation. “Assembly guards forcibly evicted us and many of us sustained injuries. Other opposition parties staged a walkout strongly protesting the action of the speaker,” he said. The DMK leader claimed that the speaker ‘ignored the rule that if the House is adjourned after moving a motion, it lapses’. He said it was ‘a mockery of democracy and a severe blow to the Constitution’. He claimed that in 1988 ‘when voting on the confidence motion was held by the speaker with only two factions of the ruling party present in the House (it was) later declared as invalid and void by the then governor’. It appealed to the Governor to weigh the proceedings in the state assembly, focusing on the speaker’s declaration that the Confidence Motion moved by Palanisami was adopted in absence of members of all the opposition parties. It urged him to invoke his constitutional powers to nullify the proceedings to protect the spirit of democracy and Constitution. Stalin in a statement said his party would stage the hunger strike from 9 am to 5 pm and condemned the adoption of trust vote after eviction of his party members. Alleging that the Motion of Confidence was adopted contravening the House rules, he called it a ‘murder of democracy’. Palaniswami won the trust vote by a 122-11 margin after the eviction of the DMK members and walkout by its allies, amid stormy scenes during which mikes were uprooted, chairs toppled and sheets of papers torn and hurled around. Immediately after the eviction of the DMK, Stalin had met the governor and urged him to postpone the trust vote. Meanwhile, in another statement on Sunday, Stalin disapproved of the act of some his party legislators sitting in the chair of Speaker P Dhanapal in the assembly. After Dhanapal was escorted out of the House on Saturday by the Watch and Ward staff amid the ruckus, DMK members P Ranganathan and Ku Ka Selvam sat in his chair for a few moments. This invited condemnation from several quarters. ‘I do not accept it as the Leader of Opposition in assembly and as their party's working president,’ Stalin said. Stating that the DMK was working with the people to oust Sasikala’s ‘proxy regime’, he asked his party MLAs to work in sync with that goal, while ‘upholding dignity’ inside and outside the House. Earlier in the day, a first information report was filed against Stalin, his party MLAs, MPs and cadres for holding a protest at the Marina beach against the alleged attack on him and his MLAs during the trust vote in the assembly. Police said an FIR has been filed against them for unlawful assembly and violation of public order. 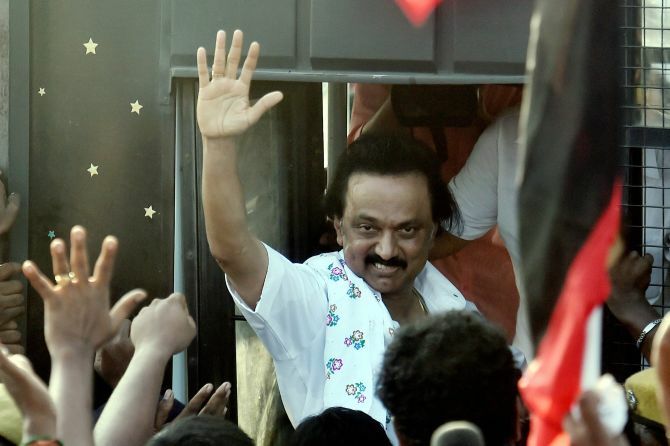 “The DMK staged the protest without obtaining prior permission as required under law,” a senior police official said. Besides Stalin, 63 MLAs, three MPs and several DMK cadres who participated in the protest have been named in the FIR, he said. Stalin was detained on Saturday after he sat on a protest at Marina beach in Chennai against the alleged attack on him and his party MLAs during the trust vote. After alleging that he was manhandled in the assembly by the marshals during the vote of confidence, which the Palaniswami government won with a comfortable margin of 122-11, Stalin sat on a protest at the Marina along with his MLAs. Several DMK workers had blocked vehicular traffic and indulged in stone-pelting in different places in the state to protest the alleged attack on Stalin.